October | 2011 | eating with S.O.L.E. As much as I am a baker, and former bakery owner.. I am not at all a bread baker. I can snap out a tart, a cake, batch after batch of cookies, bars, and squares but I seem to stumble at least mentally when it comes to yeast, not that I have had a lot of failures… but maybe just out of fear of failure, and a deep love of good bread. When I stumbled upon this simple recipe online for beer bread I thought “hey carbonated drinkable yeast isn’t too scary” and the recipe seemed totally doable. 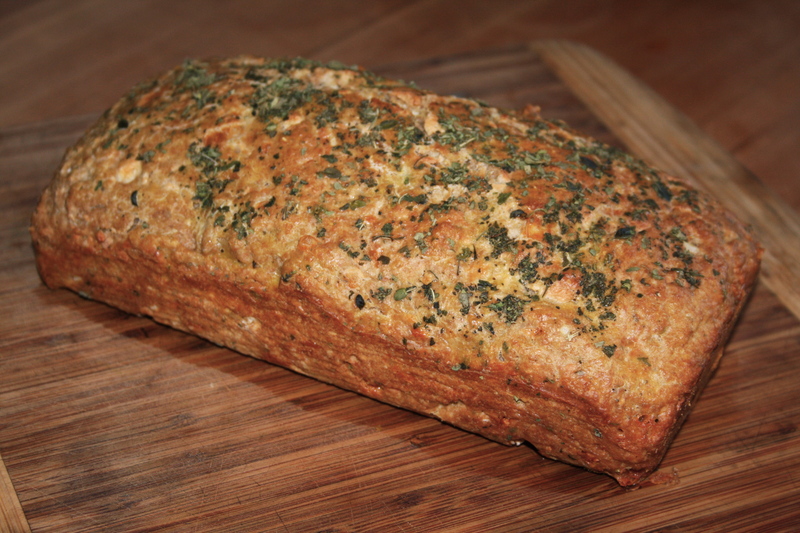 I threw it together and the results were very nice… reminiscent of an irish soda bread almost, in that it was dense and thick and it also happened to be packed with a good amount of herbs and cheese making it really very tasty. It took less than an hour from start to finish and the recipe is so short and simple that your almost certain to have everything you need on hand. Ta-da fresh bread… I served this with a big bowl of acorn squash soup and the two were a dynamic duo. 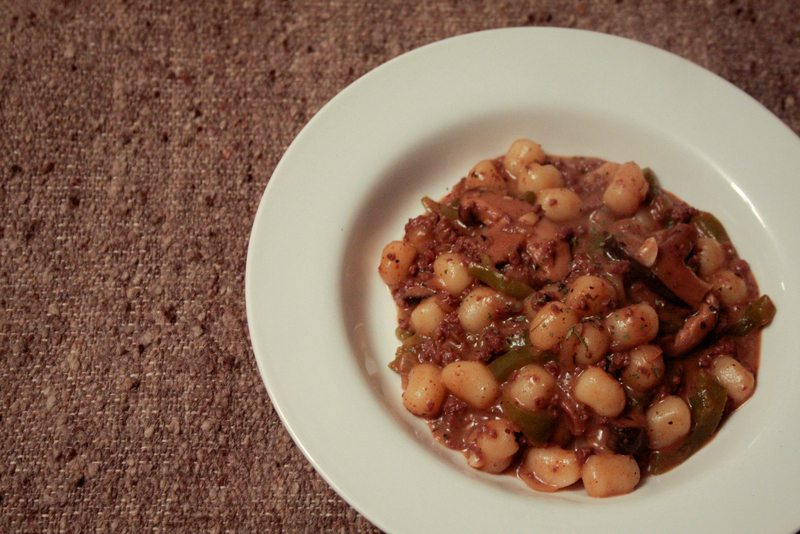 simple hearty and not at all scary! I know this dish looks pretty monotone.. but the flavours are a rainbow of fabulous-ness! This dish also happens to be maybe the best way to ever to eat squash… certainly it did the trick with my daughter.. who really dislikes every variety of squash (unless i stuff it in ravioli and slather it with cheese). I traded a few little acorn squash I grew with a girlfriend who grew lovely huge spaghetti squash, and her squash was the feature in this meal, which seamlessly blended into brown basmati rice topped with toasted tofu and roasted seeds, all in a smooth garlicky glory bowl sauce. First things first… the glory bowl dressing recipe comes from whitewater cooks recipe book and it’s fabulous on salad, rice, greens, roasted potatoes or whatever… the nice thing is you can make a big batch and keep it in the fridge, because it contains no olive oil, and it’s scrumptious! Mix well in blender or processor and keep in a mason jar ready to drizzle when ever you need a good kick of yum. 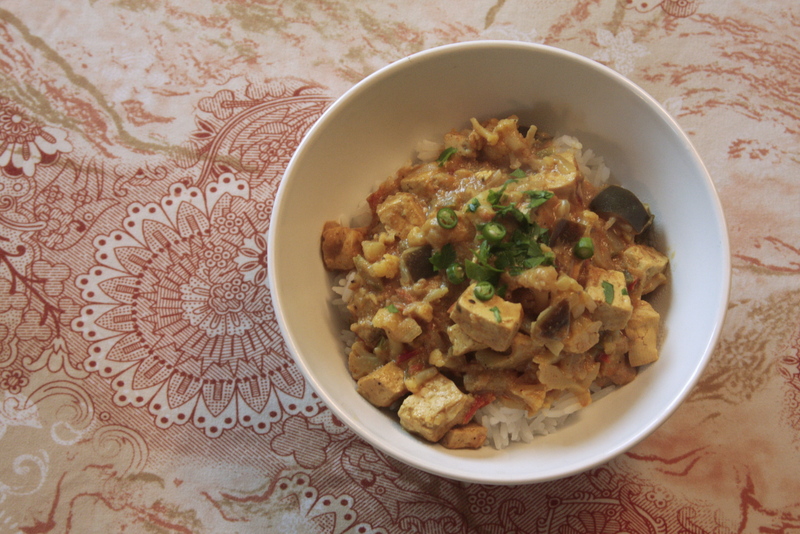 1/2 cube of firm organic tofu sliced into strips and seasoned with S+P, a pinch of cane sugar, and a dash of parsley. and all of the seeds from the squash, cleaned and patted dry then seasoned with S+P, and paprika along with a drizzle of oil and a quick toss. meanwhile cook 1.5 cups of brown basmati rice. Once the rice is cooked mix in about 3/4 of a cup of glory bowl dressing along with the garlic and oil and squash from one of the halves (use a fork to remove the spagetti squash gently from the skin). 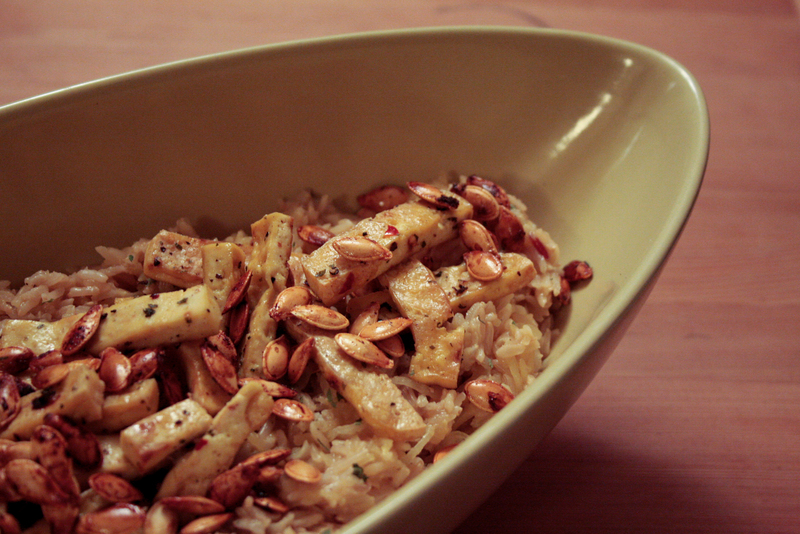 Use this rice squash rice mix as a base for your toasty tofu and seeds. The other roasted squash half is sitting in my fridge destine for a soup one day soon. If I made this again I would add some leafy bitter greens to the mix at the last minute.. as I was missing a hearty green kick.. but a big salad easily overcame my green craving, but as I stare at this yummy image.. my heart bleeds for some green! So give this a try next time you are drumming on a squash wondering how to deliver it to the table! And until then, whip up some glory bowl dressing! I just love gifts of little brown bundles of game! I was so pleased when my sweetie came home with ground venison after visiting his buddy the other day! Venison is among my most favourite meats… along with moose, goat and buffalo. I was humming over how to best use this lovely bundle, and I couldn’t say no when the cute “deer deliver boy” requested stroganoff. Plus it gave me a chance to highlight my wonderful home made HP sauce, which is the perfect addition to a meaty sauce. In a separate pot cook gnocchi’s in boiling water and once they start popping to the top and floating they are ready to strain and add to the pan along with 1 cup of goat milk (or cream). Stir well and allow everything to come to a final low boil, before covering and removing from heat. Let sit for 5 minutes before serving, then garnish with fresh herbs and dig in. This stroganoff won’t last long so don’t plan for left overs! What do you do when your friend gives you 30 ears of corn? Well I tucked into it right away! Beginning with a big ‘ol batch of this smoky sweet corn chowder.. followed by chilli corn bread muffins.. and the rest will end up in a run of frozen kernals. ‘Oh and then the chooks will be happy to peck clean each and every cob I use! This divine soup has both farm fresh milk and coconut milk which makes for a lovely balance of richness and sweetness. 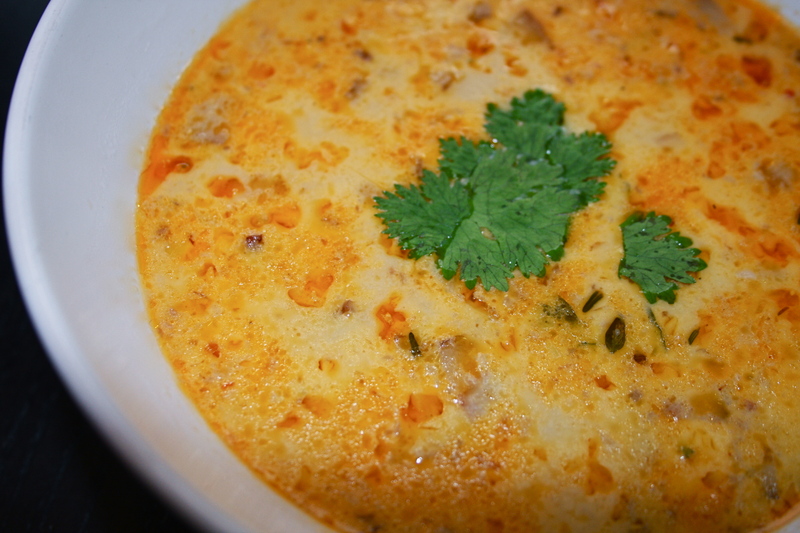 The coconut milk also helps to soothe the intense smoky heat in this chowder. My batch was crazy hot… I scaled back the chipotle and cayenne for this post… but if your a spice fiend then by all means give ‘er! If your vegan.. I think you could still pull this soup off amazingly; using half almond milk and half coconut milk.. and obviously you’ll want to omit the gateway meat… but if you do eat meat and have naturally raised lovely local smoked bacon on hand.. why would you make this soup without it? 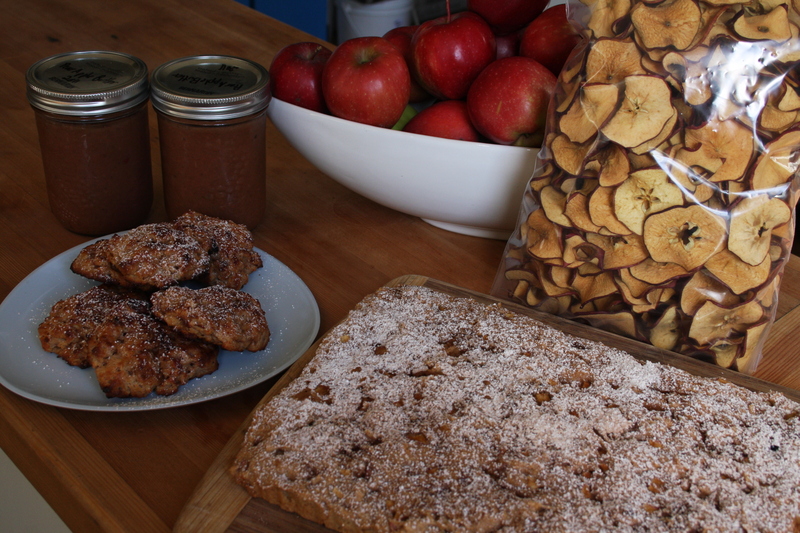 I still have many an apple to address even after a million loads of apple chips, apple butter, and scones… I still had to make an apple cake! I settled on testing a recipe from 101 cookbooks for Heidie’s buttermilk cake, but I used spelt flour and your guesses it apples! The cake was loevly with a slather of the apply pear butter I made last week, and a snowy icing sugar dusting. When I tasted this cake.. all I could think was how lovely a rosemary brown butter version would be… maybe one cold winter day to come. To celebrate thanksgiving last weekend, we went fishing up at Arrow Lake, and thanks to our skilful friend and guide we came home with a whack of beautiful Dolly Varden’s (a type of lovely silvery trout), and our holiday meal was a tail gate party of smoked salmon, crackers, cheese, cured meats, dried fruit and local beers followed by a soak in a mineral hot spring! Certainly this Thanksgiving will be a memorable one. I caught a 7.5 lb fish (the second biggest of the day), as well as a smaller 4.5 lb one, these fish also happened to be the only fish I have caught since I was about 12, so it was a pretty remarkable experience! We decided that we would smoke the whole 30 lbs of fish we brought home together, so our friend filleted the lot and brined them for 5 days in a brown sugar, salt, garlic and pepper bath, which I smoked yesterday for 8 hours, mopping the filets regularly with maple syrup. The result: a deeply smoked candy cured dry fish to die for. Well at least the fish died for the cause. Add about 2 tbsp of filing to each spring roll, brush edges with a 1 egg wash then roll: staring by folding the bottom up, then the sides in, followed by rolling the bindle up towards the top flap, to create a neat and pretty standard egg roll wrap. serve warm with a hoisin sauce or a sweet chili dip. As I mentioned earlier; in a sweeping mad rush (for fear of blight which is setting in hard all around me) I harvested all of my many tomatoes GREEN the other day, and now I find myself with boxes upon boxes of unripe heirloom tomatoes just sitting around taking up space, I don’t really have to offer. 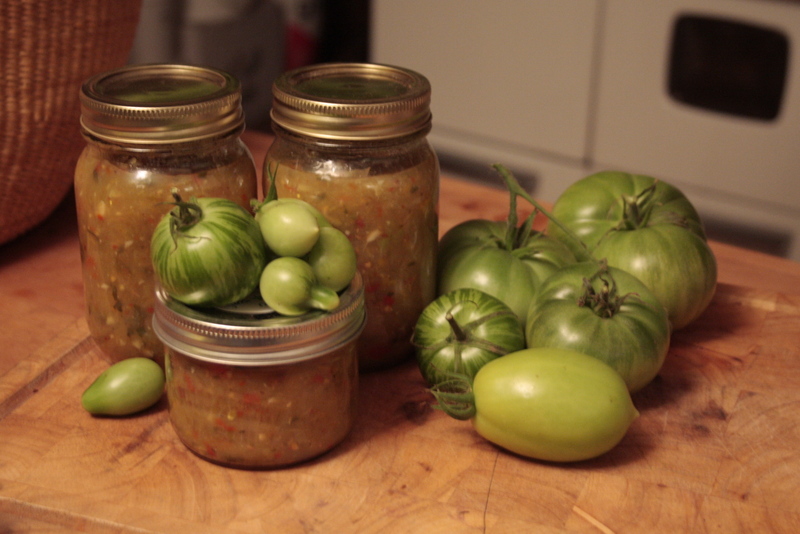 Slowly many of them are ripening as they do I am using or freezing them, but I decided to put to use a good lot of the smaller less mature green tomatoes over the weekend so I tried farmgirl fare’s green tomato recipe and I can’t tell you how thrilled I am with the results! My family love taco’s … Mexican anything in fact, so a jar of this mixed into a simmering pot of black beans or ground meat = instant taco goodness in this house. I am not usually one for relish recipes (although over the past weeks I have tried a couple fabulous ones), but it seems this isn’t so much a relish as it is a salsa, a hot a bright colourful salsa, complete with cilantro, hot peppers, and apples! I followed this sugar free recipe pretty closely (which is a little out of character for me), although I added more garlic, and used extra hot peppers including chipotle peppers, and crushed chilis along with her “optional” cumin addition. I used apple cider vinegar and fresh lime juice blended 3:1 ratio to make up the entire vinegar amount. Really this is a great recipe, and after I read about 30 reviews of it, I decided it was a must for my pantry. So glad am I with the results that I may even process another batch. I doubled the first batch, and feel like I should put another 9 jars up while I have the green tomatoes sitting around! Scones are one of those baked items I often avoid… mainly because usually they are dry, powdery and bland and always made with super white flour YUCK:( I have a friend back in Calgary Aviv of sidewalk citizen bakery who made me eat a white chocolate and berry scone of his many years ago, and that opened my eyes to the world of fluffy, light divine scone-ness. He is an artful baker who is dedicated to organic and real local ingredients, and my scones aspire to be that good. 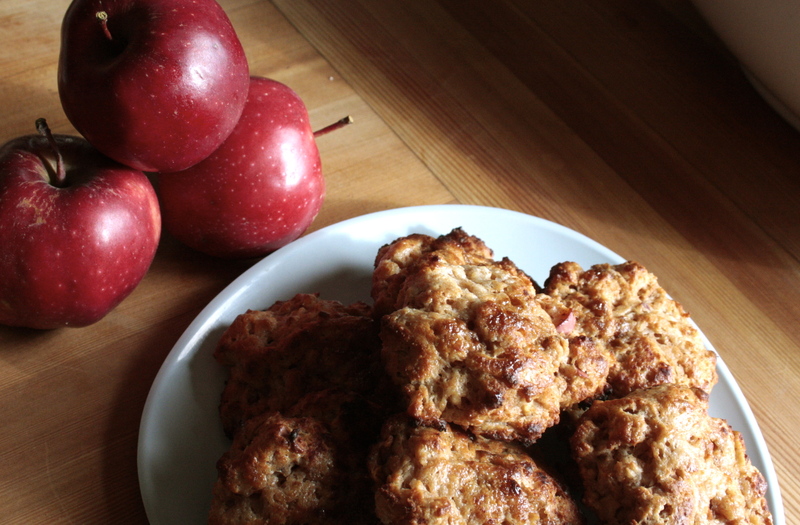 About a year ago I found a scone recipe that really did it for me, it reminded me of Avivs scones, and I have since made them a few times, usually with savory herb and cheese or chive additions, but today as I am still drowning in apples I made a cinnamon apple scone, using whole spelt flour, and they were loevly. gently combine ingredients, again don’t over mix stop when things are just combined. Along with the abundant joy and abundant fulfillment that comes with living and building our little farmstead on this stunning mountain side, in this magical valley… comes the abundance of harvest time. What a wonderful thing it is to be exhausted with putting up food. Good food, grown with love in my very own dutifully built soil… or from the overflow of abundance our friends are also sharing in. We are thankful to be in this place, in this pinnacle time, drowning in food that needs putting up. Shucked a mountain of dry beans, harvested nearly 1lb of dill seeds, harvested and passively dried dozens of kung pow hot peppers, in fear of the tomato blight I harvested everyone of my pounds and pounds of green tomatoes many of which are destine for a spicy green tomato salsa type relish to be canned today, we picked 3 enormous baskets of apples and pears which are drying into sweet snacking chips in a borrowed electric cadillac dryer, tonight I do both pear and apple butter batches too, I pulled blanched and froze a good little supply of purple carrots, I stowed away the last of the ancient Peruvian fingerling potato’s, I have bagged up the last of the passively dried bee balm leaves for earl grey tea, and the ancho chillies a precious few are also passively drying. I have fruit leather to make still at my daughters request (this will be shocking news to those of you who know her), and I want to dry a bunch more kale and some onion flakes from some of my wee little onions while I have the big food dryer here. grape jelly, hibiscus jelly, strawberry jam, kung pow crab apple pepper jelly, smoked salmon, HP sauce, pickled carrots, dilly beans, dill pickles, & drunken apricot jam. bushels of peppermint (or mosquito mint as I like to call it), bee balm, mullen, comfry, oregano, coriander, dill, basil, kale, peppers, peas and beans beans and more beans. fried chanterelle and shaggy main mushrooms, blanched carrots, beans beans and more beans, salmon steaks, dill, some roosters, strawberries, saskatoon berries, and huckleberries. That my friends is a good amount of foraged and grown food all ready for the cold winter ahead. no recipe today… just gratitude for the bounty of mother earth and the lessons we are learning in utilizing healing foods and giving back. I am glad after all these attempts I hadn’t give up on making granola bars, otherwise I never would have made it to this place of granola perfection. I have had many a pan of granola bar turn into brittle crumbly tooth chipping cereal, or worse… softy chewy falling wads of oats. I have had them all, and from a baker who doesn’t especially enjoy graonla bars… I was all set to put my attempts aside forever, except that my family loves them and is always buying boxes of $7 over-packaged organic granola bars box at the store… which I wince at time and time again. This recipe was inspired from the whitewater resort recipe book, only I put my standard SOLE spin on it.. whole grains, vegan, no GMO, less sugar, you know the drill. 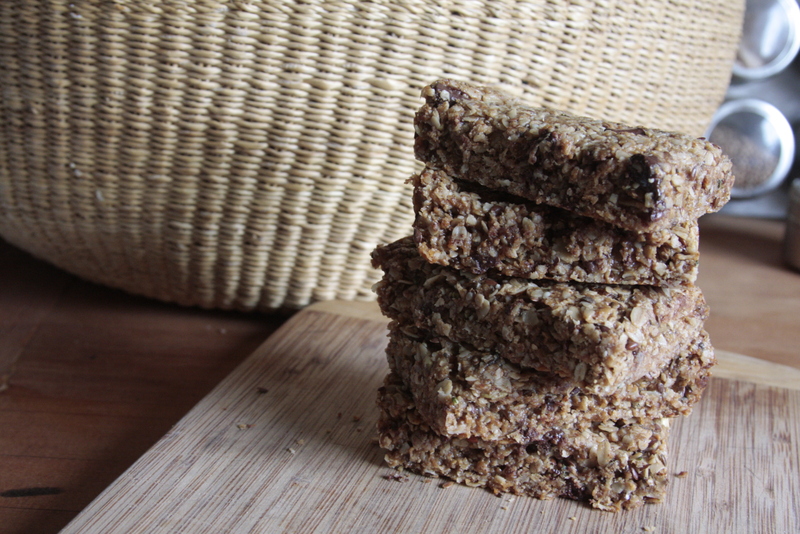 So if your anything like me and your shoulders hackle at the thought of another failed attempt.. then you have my word this recipe will bring you to the delicious state of granola bar perfection. 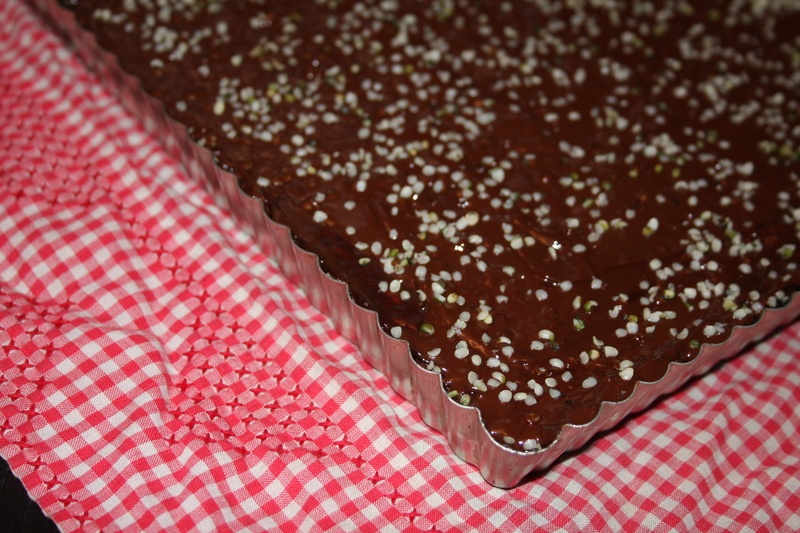 Once eveything is combined well press mixture into a silpat sheet lined 18×12 baking tray and cook for 25 minutes. It should be just golden when it;s ready to come out of the oven, allow to cool for about 5 minutes before cutting bars (in the pan still) then allow them to cool entirely. Look at this happy harvest! My first ever cauliflower (which I started from a wee seed indoors in the dark of winter) a stunning eggplant another first for this gardener, sunny tomatoes, hearty onions, garlic, sweet bell peppers, crazy hot peppers, and cilantro all cozied into a pot with a rich creamy curry sauce, what a great fall meal. Lots of people get really scared off making curry because they think they need to have a million spices and hours and hours of prep… and yes this is true in most cases, for years I made my own butter “chicken” spice blend that was made up of 15 different spices, I also used to toast and grind my own whole cumin seeds, and yes it took a lot of the day to make the perfect curry dish. But here is the good news; you really just need 4 key things that maybe you don’t have on hand.. but once you do, your off to the races and you can take on most any curry after that! The best thing about this recipe is it uses only 5 ingredients and takes less than 15 minutes before you can put a cookie into your mouth. These are wheat free and lactose free, super simple and pretty darn good considering they are missing nearly all of the very building blocks of good cookies requirements. but you could try: rolling the dough balls in a cinnamon sugar mix or top each one with a lovely little chocolate round or roll them in coconut or roll them in icing sugar (for a cracked snowy mountain effect) or add a dollop of jam to each for amazing AB+J treats! 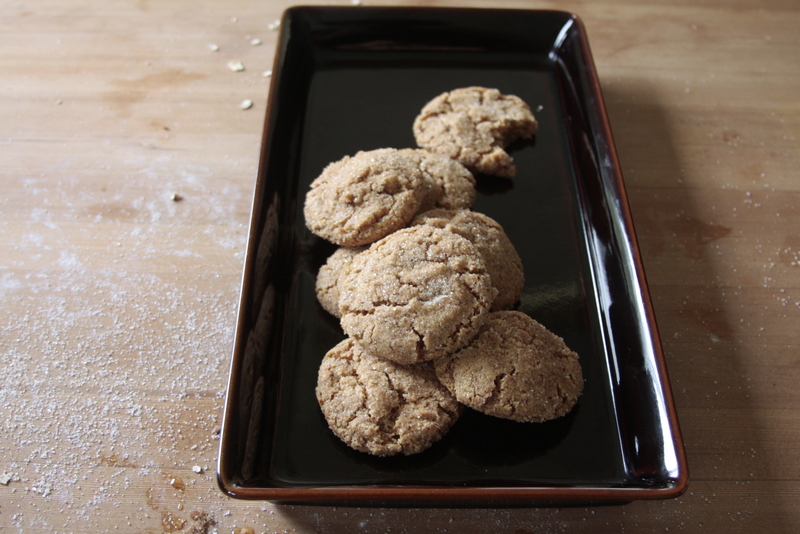 anyway you make them, I am sure you will enjoy these little almond darlings! When we came home with 10 nice Sockeye salmons a few weeks back, I started dreaming of smoking them. Most ended up cut into nice steaks and frozen down with fresh dill in food saver packs, but 3 large whole fish were destine for a smoker… somewhere somehow those lovely fish were going to get smokey! Luckily our friend and avid fisherman had just returned from the Queen Charlottes with a load of Coho and Spring salmons and he and I had a similar vision for smoked canned fish. He had the experience, and borrowed some extra equipment, so that we were able to have 2 electric smokers going all day, along with a camp chef and two huge capacity pressure cookers. After 10 hours of processing we ended up with 9 dozen pint cans full, a few buckets of fish skins for the dogs and a unreal craving to crack into a can to sample our days efforts! OMG divine, sweet smokey salmon-y goodness in a jar, what could be better? Briefly the process involved, steak-ing the frozen salmons (using a chop saw outdoors, while chasing away bears), brining the steaks in a salt, sugar, water and garlic bath overnight, then smoking the fish for 90-120 minutes with heated hickory smoke, we then removed the bones (the big ones at least) and skin, placing chunks of salmon into clean wide mouth pint jars which were then processed for 90 minutes at 12 lbs of pressure. Once home with my little stash of jars I wanted to find a cozy plate to dish our sweet salmon on, as I still had a mountain of chanterelles in the fridge I settled on making a creamy brandy dill salmon pasta, with fresh chard and forest foraged chanterelle’s. My partner called it gourmet tuna helper, and he was requesting a potato chip crumble on top for next time I make this! once the moisture in the mushroom has released and evaporated (5 min) add a pad of butter along with S+P, and fry a little longer. It was a real hunter gatherer kind of day which started in the wee dark hours of the morning, as my partner set off for his first ever bow hunt, I was in bed dreaming of venison meals to come. Mid morning the hunters came back empty handed, but luckily our mushroom hunting afternoon was totally successful! 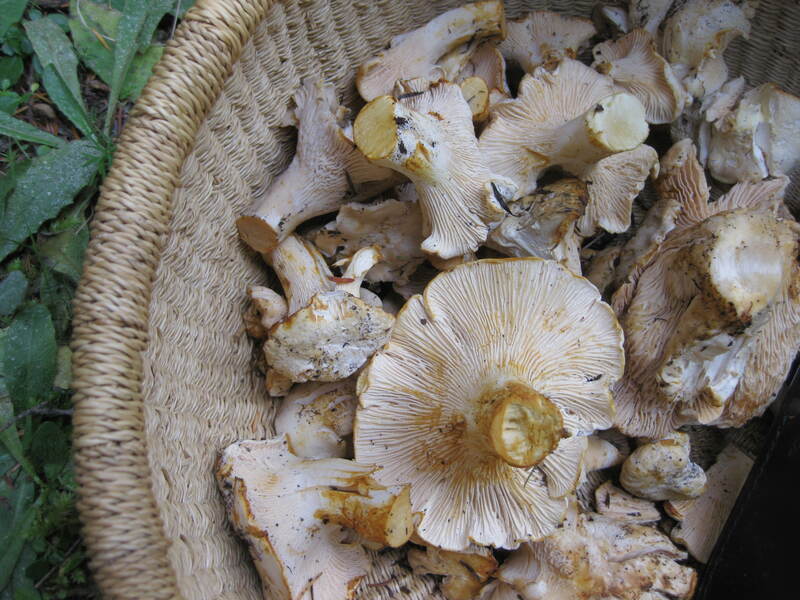 Today was our local fall mushroom class and forest foraging, and just like last year it was wonderful! There is so much about mycology to learn and taste! Last year we were flush with pine mushrooms, and this year we came home with a huge basket of chanterelles. At the end of the foraging session we enjoyed a tail gate mushroom and wine tasting… which got my taste buds fired up! I came home and cleaned and trimmed a whack of these beautiful shrooms, while deciding what kind of meals to build around them. 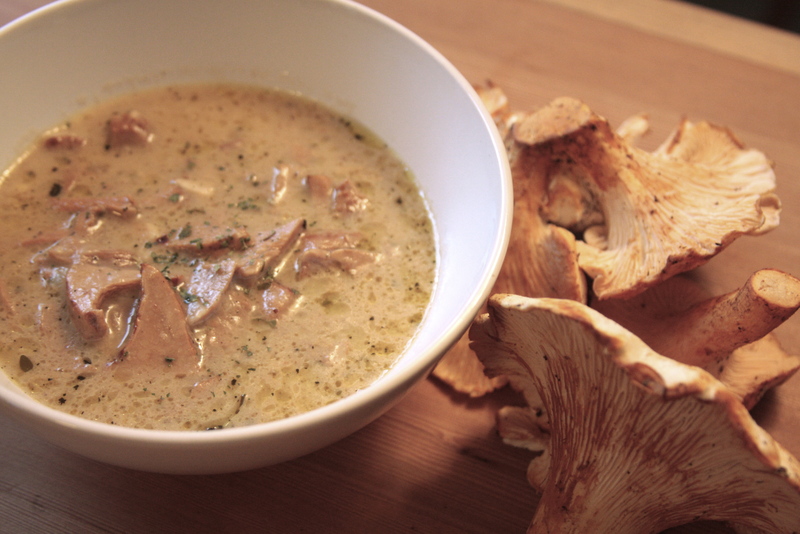 For tonight I settled on cream of chanterelle soup, and it turned out divine and rich, and meaty with mounds of thick cut mushrooms throughout. After sharing some fungi and making this big old pot of soup we still have enough mushrooms for a few more meals! It is one thing to forage through your garden and pick your dinner, one of my favourite things in fact to do, but the hunt of forest walking and foraging is a whole different level of rewarding and deliciousness! Cook these all down for about 15 minutes at which time they will be golden brown and have reduced by nearly half and your house will smell divine. In a small bowl put 2 tbsp potato flour and stir/ wisk really well into about 2 cups of boiling water, remove lumps and add thickener into soup. Allow soup to cook for another 15 minutes, then remove bay leaf, finish with a sprinkle of more fresh herbs and serve. 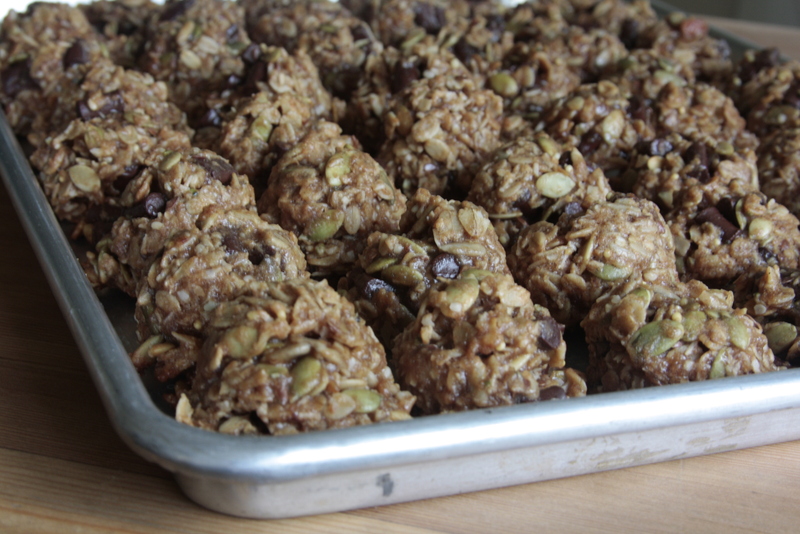 These are an adaptation of my favorite go to vegan spelt cookies. Yesterday I started the day off with a total pantry overhaul, out with the everything and in with the tidy sorted, labeled, food-saver’d, mouse proof stocks for the winter. The chickens were in heaven as it rained down old rice crackers, and bits of random cereal and sea weed, and as it turned out my family and dinner guests were also blessed with the pantry clean, as I just kept pouring nut, seed, and oat finds into a giant measuring cup to make these divine little cookies. The best thing about this recipe is you can use 6 cups of anything you have on hand in any proportion along with the flour and wet ingredients, and you’ll always yield a great result. I have done coconut + oats, as well as every dried fruit and nut on the planet, just chocolate and oat, just granola… whatever you have will fly. Now add 6 cups of goodies. *the top never appears “baked” in the classic sense, but the bottom edges will start to brown and you should be able to tip the cookies to ensure the bottom is set and golden.. then away you go, start sharing the goodness.